There's an ongoing effort to test the most popular herbal medicines to see how well they really work. The Early Show medical correspondent Dr. Emily Senay says the latest study along those lines is raising doubts about the effectiveness of Echinacea in warding off colds. Senay points out that there's a wide variety of herbal medicines available over-the-counter, making a variety of health claims. Among them is echinacea to boost the immune system, Gingko Biloba to improve memory, and St. John's Wort to relieve depression. These medicines have been largely dismissed by many Western doctors due to a lack of solid proof that they work, Senay observes. But, in recent years, scientists have started putting them to the test in studies with the same standards applied to modern conventional medicine. 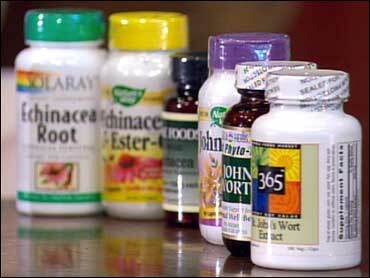 The study on echinacea appears in the latest New England Journal of Medicine. Echinacea is a flower prepared in different ways as an herbal remedy to boost the immune system to ward off colds and respiratory infections, Senay explains. About 400 people were given various combinations of echinacea extract or placebo pills and then exposed to a rhinovirus that causes the common cold. The researchers concluded that, when it comes to colds, echinacea has no clinically significant effects on illness or infection. About 90 percent of all of the groups became infected. Symptoms such as sneezing, runny noses and sore throat were about the same in all groups. It's still possible, Senay says, that higher doses or different ways of preparing the echinacea may have different results, and the study didn't look at its impact on other respiratory infections. As for Gingko Biloba, Senay says the gingko tree extract is an effective herbal treatment for people suffering from impaired memory or cognitive skills, and is widely touted as a memory enhancer for healthy people, as well. But research has shown that gingko doesn't enhance memory or improve cognitive abilities such as learning or concentration in healthy older adults with normal cognitive skills and no mental impairments. Again, it's difficult to provide conclusive evidence that rules out the effectiveness of every brand. What's more, the jury is still out on St. John's Wort, Senay says. It's a plant-based herbal medicine often promoted as an aid in fighting depression. Research has yielded conflicting results. In one study, it was ineffective against severe depression, as was the drug Zoloft. And the placebo effect was shown to be stronger than that of both St. John's Wort and Zoloft. Other studies seem to indicate St. John's Wort may still have a role to play in the treatment of mild to moderate depression. Consult with your doctor before you start taking any herbal supplement, Senay suggests, and always keep your doctor informed of what you're taking. There are risks to consider when mixing medication with supplements. Herbals can affect the potency of other medications, or cause unexpected side effects. South Bend, Indiana, Mayor Pete Buttigieg has found himself near the top of another poll this week, ranking third behind Sen. Bernie Sanders and former Vice President Joe Biden in the University of New Hampshire "Granite State Poll." David Weigel, a national reporter covering politics for The Washington Post, and former Houston Mayor Annise Parker, who now leads the LGBTQ Victory Fund, join CBSN's "Red & Blue" with a look at the historical significance of Buttigieg's candidacy.